We managed to get out for an almost real snowbiking on a weekend. Suomusjärvi – Karjaa, about 60 km on gravel roads. One forest road was not cleaned of the snow, and we had to drag bikes for several kilometers. What a joy! That was the first – and I’m afraid the only – day in this winter when I enjoyed the snow. All other roads were either clean asphalt, or covered with smooth ice. Good for the one who had both studded tires! 🙂 I’m so much missing the real winter; well now I’ll have at least one memory of it. 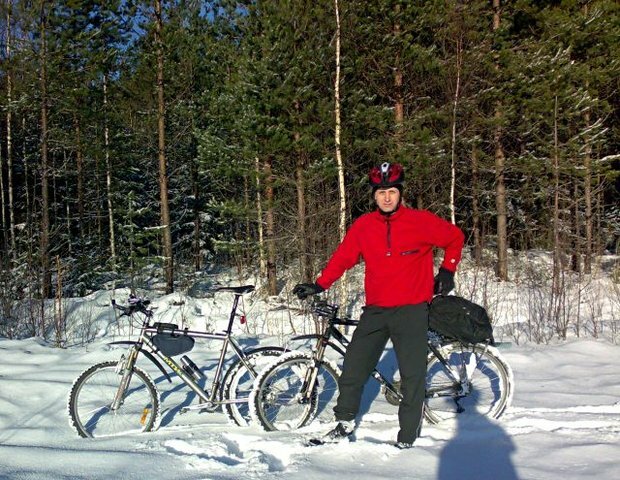 This entry was posted in Cycling, Outdoors by konstantin. Bookmark the permalink.